I have reviewed a variety of HexBug products over the years now and I am feeling like somewhat of a HexBug expert. 🙂 Okay well realistically my Little One is the HexBug expert. The latest HexBug product that we have checked out is the HexBUg nano Nitro Slingshot. Okay seriously, just by the name, didn’t you get excited? I know we sure did. Slingshots and the fastest HexBugs, being the nano series, well how can that not be fun! Discover and experience an all new realm of fun with the HEXBUG® nano Nitro Slingshot. This multi-tiered playset unlocks a world of uncharted territories for the nano Nitro, the fastest nano ever. Create customizable playgrounds for this industrious critter to traverse, with easy snap together pieces; your imagination is the limit! fine-motor skills, and fuel hours of amusement. This set contains straight, curved, and spiral pieces for an immeasurable amount of personalized track combinations. Toys”R”Us, Mastermind Toys and Amazon.ca as well as HEXBUG.com. Ages 3 and up. As a safety aspect, I do have to mention that HexBugs are small so please pay attention to the recommended age as they do post a chocking hazard. 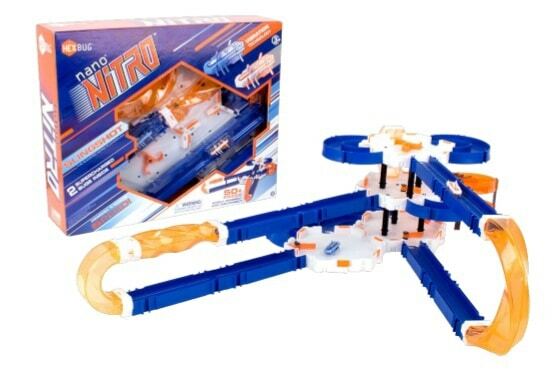 With the HexBug nano Nitro Slingshot play set, kids can build their own playground as the pieces easily snap together. So whatever your little one can imagine the combination of pieces to be, they can set their skills to building it all on their own. The flexibility of building options makes the product engaging for quite some time. Once the HexBug has traversed through one set up, kids can tear it down and build a different course for their HexBugs to roam around. In total there are over 50 pieces to snap and build in the HexBug nano Nitro Slingshot set. The set also includes 2 nano bugs. Batteries are also included, which of course is something that I love. Ideally, I would recommend the play set for ages 7 and older. In this age grouping, kids will likely be able to play with the set by themselves. I can see younger kids loving the play set as well, but may need a little help engineering the playground. I really love products that are multi use. What I mean by that is, that this is not just a build and leave play set. I love that it taps into a child’s imagination and creativity, to get them thinking and working with the pieces so that they try building whatever their mind and the pieces allow. I always find multi use toys like these get more mileage at play time, than sets where there is only one building plan. There are a number of HexBug nano Habitat sets that you can check out for added HexBug play time. HexBugs have been around for quite a number of years now, and they do not seem to be losing any steam with their ability to engage and tap into the interests of children. These play sets only allow the HexBug collections to grow and continue to see more play time. I am also intrigued by the HexBug Nano V2 Black Hole play set. To check out more about everything HexBug, make sure to visit them here….